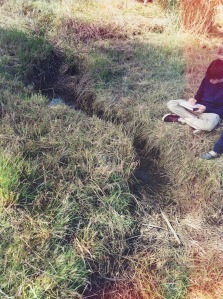 It was a perfect afternoon when my marine science class decided to go for a walk behind our school. We started off near the ‘Blue Heron’ stream, a small and quite area. The bridge over the waterway was the place we chose to meet. Like any other little stream during summer time, the area was dry but not to the point of drought. There was very little water and was not flowing. Just a pile of dirty water farther down the left of the bridge was seen. The inlet seemed to be blocked by some kind of plants or weeds. Dehydrated vegetation was all around. However, in some shady area under the bigger trees, the shrubs are quite moist and lively. The right side of the stream was full of tall shrubs and grass. Right there was a colony of spiders! I was trying my very best not to step in any of them. One of my classmates pointed out that it might have been their mating season. After we all jotted down our observations, we followed a path into the ‘Memorial Park Forest.’ It was a little bit cooler there, as the tall trees blocked off some of the sun light. The forest might have been a site for the logging industry a long time ago. There was one huge tree that we estimated to be around 400 years old. Because if it’s bark and fallen pine cones, we were able to identified that it was a Douglass-fern tree that had remained untouched from logging. As we continued our walk, one of my friends stopped to look at the Ivy plants with whites speckles all over them. They might have been injected with disease, I thought. Suddenly we all heard “HOOT! HOOT!”. 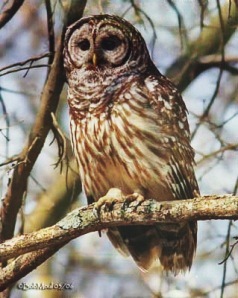 It was a Barred owl!! We then realized the white speckles on the plants were actually their droppings. That was the highlight of my afternoon.